Mr. Penumbra’s 24-Hour Bookstore by Robin Sloan | Blah! My wife got me a Kindle for my birthday and, I have to admit, I’ve spent more time playing games on it than reading books. However, during a recent business trip to Florida (13 hours going, 15 hours coming back!) I took the opportunity to read my first piece of fiction on the Kindle (I’ve read one other book, non-fiction, and I’ll post about that soon). 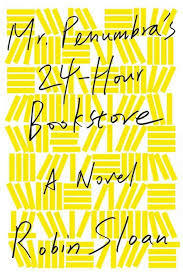 Mr. Penumbra’s 24-Hour Bookstore, by Robin Sloan, is about, well, books. Books in the tradition paper format and books in electronic format. Books as each author’s masterpiece and books as collections of data. The story revolves around a mysterious secret society, a society that is discovered by the hero, Clay Jannon, when he, as an out-of-work 20-something, takes a job at a bookstore, Mr. Penumbra’s bookstore. The bookstore is stocked with the oddest of books, which are bought by the oddest of patrons. As Clay learns more about what is going on, applying computer algorithms to problems that the patrons have spent literally centuries examining, he uncovers an ancient riddle. A couple of things did bother me in the plot. I won’t say much to not spoil the story, but if anyone else reads this and has some insight, I’d be interested in hearing it. First, I don’t get the code. I don’t get how it was supposed to work. Anyone understand it? The explanation doesn’t make sense to me. Second, I don’t understand how the Google employee, Kat, falls for the idea of what the puzzle might provide, if solved. She is a tech person, not into something supernatural. Unless that is another point the author is trying to make. However, in spite of these concerns, the book is still very entertaining, fast paced, and does explore some interesting questions. It makes you think, at least a bit.